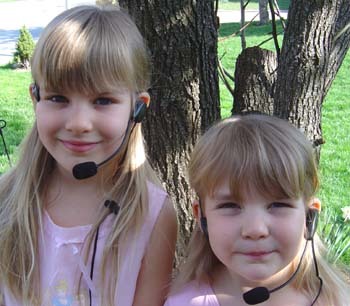 The external speaker headsets are designed for adults but they work great with children, too. 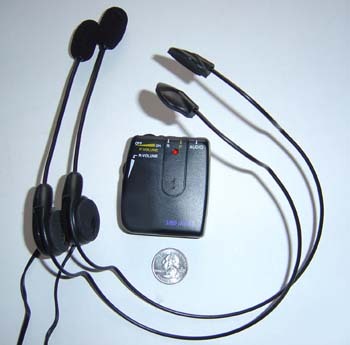 Put the headset on like a ball cap with the wire hoop behind your head and the speaker resting over the left ear so the microphone boom points towards the mouth. See picture of the kids for a visual. Slide BOTH sides rearward so the speaker is next to the auditory canal for optimal hearing. Adjust the microphone kissing close to your mouth. The microphone is not positioned ideally when the photo of the kids was taken. Make sure the microphone is pointed towards the mouth. Pull the foam cover back one time to visualize which way the microphone faces after which you will be able to tell by feeling it. You may want to mark it in some way for easy visual reference. The microphone is directional and noise canceling and works best when not pointed into the wind! After the ear and microphone positions are optimized, with the unit "OFF", plug in both headsets being mindful not to use the "Audio" port. Stokers typically use the port marked with Yellow, which is assigned to the volume control with the on/off switch. Turn on the unit and adjust each volume saying test words like, "Can you hear me now?" or like our then 4 year old got us to doing, "Blah, blah, blah", in a normal voice as if speaking to someone in the same room. Strive for low but satisfactory volume settings which will reduce or eliminate wind and traffic noise except during extreme conditions. Some mark the volume dial with a drop of paint for an easy reference to instantly set the volume to the correct level once it has been determined. Others simply learn how far to rotate the dial and one "Blah, blah, blah is sufficient." The captain usually carries the power unit sideways in his left jersey pocket with the volume control on the side facing up. This orientation prevents unnecessary bends in the cords that may stress the wires. Once accustomed to riding with the unit the desired volume level is easily attainable. If the stoker likes to stand out of the saddle, they may wish to run the wire under their left shirt sleeve which helps keep it out of the way. The captain's wire usually goes down the back either inside or outside of the jersey. Some people put the headset on before the helmet while others prefer to put it on afterwards. You may find it beneficial to slide the foam tubes rearward or remove them all together. Others shape the hoop of the headset to optimize their hearing ability and added comfort. Before bending it, we recommend finding the optimal speaker position for your ear. Visually look at the speaker and then with the aid of a mirror see where it rests in relation to the auditory canal. A second way to determine optimal positioning is to find the position that provides maximum volume by moving the unit around on your ear while the microphone from the other unit is positioned near a stereo speaker. Once the loudest position is found, hold it in place and go to a mirror where you can shape the hoop to hold the speaker on that position on your ear. The Tandem-Com is very easy to use and intuitive thanks to the simplicity of the unit and comfort of the Ultra Headsets. Is it normal to experience extra noise, garbled sound and difficulty hearing when going down a hill at 30 mph into a 20 mph headwind with heavy traffic going by? The microphones are directional. Make sure they face your lips and do not point into the wind. To determine the directionality, remove the windscreen one time to see which way it faces. Now that the shape has been identified you will be able to aim it correctly by feeling through the foam. You may also mark it for a visual reference. Eliminate unnecessarily high volume settings with optimal headset positioning. Make sure the headset is pulled back on BOTH sides to bring the speaker as close as possible to the auditory canal. Position each microphone kissing close to the mouth. You may find that putting the headset on after the helmet works better than before. Once headset positioning is optimized, set the volume on a low setting for clear clean sound. Further optimize the speaker position by shaping the headset hoop.. Use a mirror determine the speaker proximity to the auditory canal. Gently reshape the wire accordingly, if needed. Alternatively, find the optimal speaker position by moving it around with the other headset microphone exposed to a stereo speaker or other sound source. Low battery voltage will cause this problem. Replace the batteries with fresh AAA Alkaline cells or Lithium cells. We are now getting pops, snaps and crackle sounds in our system. What causes this? 99% of the time this is resultant of a poor connection from either dirty contacts or a broken headset wire. Clean each headset plug with rubbing alcohol and see if this solves the problem. A bit of dielectric bulb grease, available from auto part stores, will help maintain a good connection. The headset wires are vulnerable to wear and tear from constant handling and receiving inadvertent tugs and pulls. To help eliminate this problem and to provide a superior product we use a special sheathed cord with reinforced ends. If an internal wire has been broken, the headset needs to be replaced unless you are handy with a soldering iron. We have replacement headsets listed in our Accessories catalog under Intercoms. Why has my volume dropped even though it is turned up all of the way? If your headset and microphones are properly positioned, suspect low battery voltage. Install fresh AAA Alkaline or Lithium cells and be sure to turn your volume back down! I hear croaking sounds, rhythmic somewhat musical sounds at times. Why? Cell phones cause a variety of feedback issues. Make sure the WIFI and Bluetooth features are turned off. Increase the distance between the phone and the power unit since incoming calls can cause spikes in power and other situations such as handoffs from one tower to another. USUALLY SAME DAY SHIPPING IF ORDER RECEIVED BY 3:00 P.M. C.D.T.